Most liquid waxes can be applied by hand or sprayed. 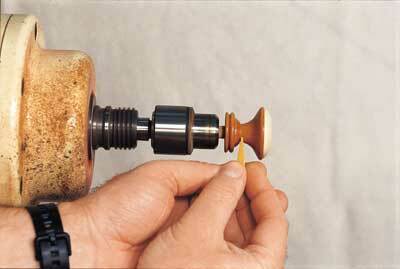 Large turnings and carved areas are good candidates for spraying when a waxed finish is desired. Thin liquid waxes can be sprayed with disposable sprayers like the Preval Sprayer, or with something as simple as an artist's airbrush. Larger turnings will benefit from the greater transfer efficiency of HVLP (high volume low pressure) sprayers, which can atomise the liquid into tiny droplets. Like any wax, sprayed waxes need to be applied very lightly for best results. Heavily carved areas are easily sprayed and can be buffed with a natural bristle brush when the solvent has flashed off. Although sprayed waxes are not common in a woodturning environment, they can offer speed and convenience for larger work pieces. Spraying waxes requires the use of respirators fitted with the appropriate vapour cartridge for the specific solvent used in the wax. Consult the manufacturer for requirements for spraying their wax products. Friction waxes contain pure or blended waxes. When used correctly they can provide a quick and efficient method for applying high-lustre waxes to turnings. Some manufacturers also incorporate polishing compounds in their friction wax bars to increase the ultimate lustre level. Friction waxes are applied while the piece is spinning on the lathe at high revs. Depending on the blend of waxes used, the friction wax bars can range from soft (beeswax based) to very hard (Carnauba based) in density. Do note that some friction wax bars are so hard that, if the turner presses the wax too hard against the spinning timber, they can damage softer timbers during application. The most common form of friction wax is pure solid Carnauba wax. I purchase No.1 Grade Carnauba in the flake form and melt it into small bars. These bars are then cut into small right-angle pieces for use on the lathe. Commercial friction bars range from small slender bars to thick large bars. However, no matter whether you make your own friction wax bars or you decide to buy them, you will achieve better and more consistent results if you apply the wax to the turning with a sharp thin edge. The large size of most commercial friction wax bars can make it difficult to apply them properly. Large flat or rounded edges are less than ideal for applying a friction wax and may cause an uneven coating to be applied. What you want is a relatively small, sharp edge that will melt readily and get into tight areas with ease. A sharp edge will also be easier to control and lay down an even coating while the turning is traversed. When the edge becomes excessively rounded, a small knife is used to scrape the rounded edge back into a sharp line. The bars are easily cut with a small handsaw into right-angle shaped pieces. The shavings from cutting the bars and keeping the edge keen are kept in a small jar and melted periodically to form additional pieces. Pure, solid Carnauba wax imparts a brilliant gloss to woodturnings, and in my experience has proven to be a very durable finish on items that do not see excessive handling. Although this protocol was developed for pure Carnauba wax, it will also work for applying normal friction wax. To achieve the highest possible gloss level, follow these simple rules. Wash your hands after sanding! Any residual bits of sawdust or sanding grit on your hands, or in your fingerprints, will compromise the quality of the lustre if you touch the piece while it is rotating on the lathe. Cut a small wedge from a solid bar of Carnauba wax. One end of the wedge should taper to a fine line. The other end should be 5-6mm (3/16-1/4in) wide when cut from standard Carnauba wax bars. Use the sharp edge end to apply the wax to the turning while it is rotating at 3000rpm, or as fast as you can safely turn the piece. Friction will melt a thin layer of wax onto the surface of the turning. As you are moving the wax wedge across the turning, you can see a dull band of wax being applied to the surface. Move at a constant speed across the surface and apply a thin, even coating. Do not press too hard or excess wax may be deposited into the pores. Maintain the sharp edge on the wedge tip by scraping the area periodically with a knife. To buff the piece, start at one end and apply sufficient pressure with a CLEAN piece of safety cloth, or a small piece of 100% cotton cloth, to melt the thin layer of surface wax. Do not apply too much pressure while buffing or you will remove the wax. Applying too little pressure will cause streaks. A final light buff across the surface will deliver a brilliant gloss finish. Before removing the piece from the lathe, either cool the surface briefly with a few short blasts of compressed air or let the piece spin freely for a few seconds on the lathe before removing it. If you are making a production run, prevent scratches by storing finished pieces in a protective bag lined with a soft cloth. Due to speed and safety considerations, larger turnings cannot be polished using this method. However, you can use a supplemental buffing system such as the Beall Buffing System or the Chris Stott Buffing System to apply pure Carnauba safely to the surface of larger turnings using the appropriate buffing wheel. Another option is to apply a high-grade Carnauba paste wax to the surface and then buff the turning with a soft flannel buffing wheel at 1200-1750rpm. Hand-held buffers could also be used if the piece is too large or heavy to work on a stationary buffing wheel. Waxes are available in numerous colours from totally clear microcrystalline waxes to jet-black patinating waxes. When waxing dark-coloured timbers, use a matching coloured wax to eliminate any possibility of whitish residues being left in the pores and to add an extra bit of warmth to the colour of the timber. Microcrystalline waxes will dry crystal clear on any colour of timber. To accentuate the grain on lighter timbers, use a dark-coloured wax to add a provocative touch to the piece. The darker wax will remain in the wood pores, highlighting them and providing a colour contrast on pale timbers with large pores, like ash, oak, pecan and elm. 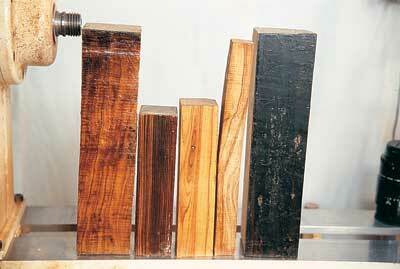 This is basically a reverse of the effect created when liming wax is used on dark or black-coloured timbers. I frequently use dark-coloured waxes - with and without additional pigments or metal dusts - on weed pots that are made from pale, local timbers with straight grain. For an even greater visual effect, metal powders can be added to the wax to add a reflective sparkle to the pores. Metal powders such as copper, bronze, brass, gold and silver are easily obtained and can be added to suit personal taste. Numerous earth and man-made pigments are also available to create virtually any colour imaginable. Oil-soluble dyes may also be used to colour waxes. These can be easily mixed in small quantities, exactly to your personal specifications. For most of the speciality waxes I create in this manner, I prefer a clear microcrystalline base wax like Arbortech's Arborwax or Renaissance Wax. Pigments or metal dusts are added to a small amount of wax and are mixed thoroughly with a small artist's knife. When you are satisfied with the colour of the wax, use a small folded piece of kitchen paper or soft cloth to apply the wax to the turning. The wax should be rubbed well into the pores across the grain to ensure an even colour effect. Excess wax is removed with a soft cloth, wiping along the grain. To raise the lustre, apply a final coating of clear wax and gently buff it with a soft cotton cloth. Any wax left after finishing a piece can be kept in small tins for later use. If you prefer to purchase special-effect waxes instead of making your own, several manufacturers make speciality waxes in numerous colours. Paste wax is useful when power sanding difficult grain areas on the lathe. 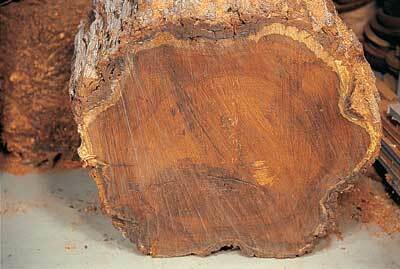 Torn or bruised grain areas can be difficult to remove on some timbers. However, wiping a small bit of ordinary paste wax into the area will allow the abrasives to work more efficiently on the damaged area. 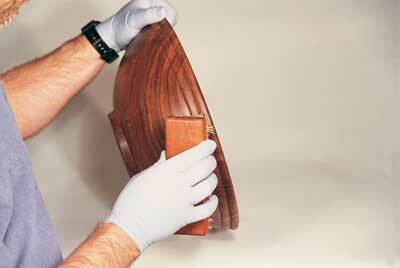 After applying the wax, use a piece of safety cloth to remove any excess wax and prepare the surface for sanding. The first or second sanding discs you apply may become loaded very quickly when power sanding the waxed area, but the subsequent discs will cut very cleanly. Loaded discs can be run against a crepe rubber pad to remove the accumulated debris, and used again. This technique works amazingly well with many timbers, as long as the surface damage is not too deep. 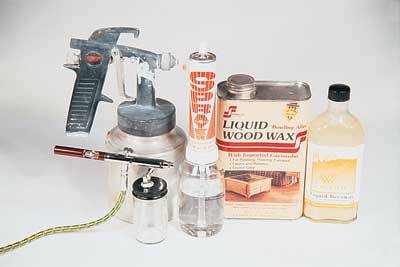 Paste waxes can also be used with wet/dry papers on the lathe, instead of water or other wetting agents. The wax lubricates the paper, reducing heat checking in sensitive timbers, and produces a more uniformly sanded surface. Residual wax can be removed from the surface with a solvent wash of naphtha or white spirit. "The most common form of friction wax is pure solid Carnauba wax"
- To ensure colour uniformity throughout the wax when working with earth pigments, melt the wax in a double boiler and stir the pigment and wax thoroughly. When cool, the wax is ready to apply. Never expose the wax to a live flame during heating! Modern waxes can contain numerous solvents and other potentially harmful additives. 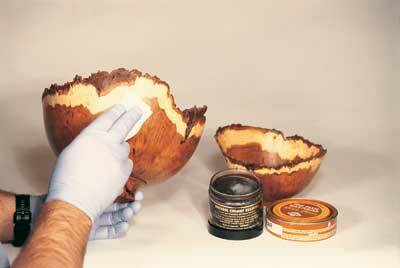 When applying or using waxes, proper protective equipment should be worn. This includes solvent-resistant gloves, a respirator fitted with the appropriate organic vapour cartridge, and eye protection. Hazardous ingredient information for a particular wax may be obtained from the manufacturer in the form of MSDS sheets in the United States and COSHH sheets in the United Kingdom.